After 13 years of using the Impreza sedan platform for the WRX/STI, Subaru change direction and released the MY08 "Ugly Betty" hatchback Impreza. Some say they have SOLD OUT and gone mainstream, softened the WRX image to sell to the masses, especially those in the USA. 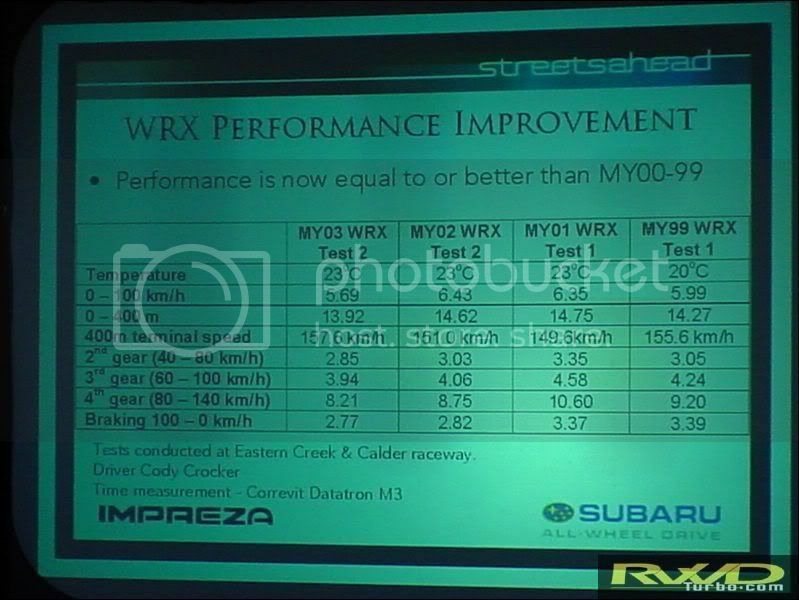 ** Performance figures for the 99-->03 WRX are taken from Subaru Oz testing in July 2003. Last edited by WRXTASY; 06-12-2008 at 01:38 PM. so am i right in thinking 206kw is 280bhp?? are they really that underpowered oz official cars??? aus cars are offseting the torque with a 2.5 litre. hp per litre, the non-jdm cars are down. Seems Subaru have finally woken up to themselves with the release of the 09 WRX Sedan. Its interesting to note that the 09 WRX now has identical power and torque figures to that of the EJ207 02-->05 STi but carries 75 Kg less weight and has dual AVCS for a better torque spread. 09 WRX will be good Bang for the Buck again me-thinks!!! !